Whip out the grill—it’s time to get fancy with corn, the most-produced grain worldwide. 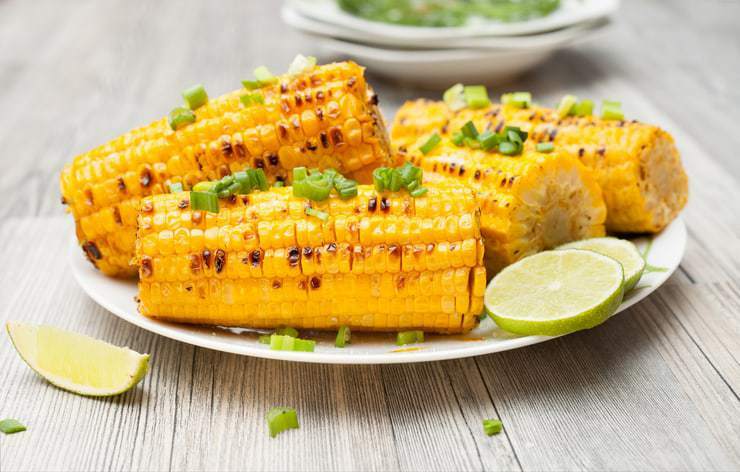 Grilled corn is tasty and also a great side dish for summer meals. Corn is a great source of vitamin C, folic acid, and niacin. It’s also full of protein, fiber, magnesium, iron, and zinc. Corn is a grain, not a vegetable, and it helps prevent heart disease. While this grain is notoriously hard to digest, its insoluble fiber cleans out the digestive tract. Bi-color corns grown in Florida and California are available right now—it’s a delicious variety that you should consider using for this recipe. You will be using olive oil in this recipe as well. Olive oil contains oleic acid or omega-9 that helps prevent cancer and keeps our arteries supple. This prevents heart disease. This recipe also calls for truffle oil. Truffle oil is essentially olive oil infused with black or white truffles. Prized for their gastronomic contributions, the truffles are high in protein, essential amino acids, and fiber. Imitation truffle oil is actually synthetically, created to mimic the smell, so try to avoid it and go with the authentic truffle oil. You’re going to need the right corn. Many supermarkets receive corns with the husks on. You’ll need to leave these on for this recipe. The Mindful recipe for the grilled corn is listed below. Peel back the husk, removing a layer or two of tough green husk. Keep remaining husk on the corn stem. Once the corn is exposed, remove the corn silk. Use a wet paper napkin to help wipe the silk off. Rinse the corn and the husks under water. Shake the water off. Mix the ingredients and use a brush to liberally coat the mixture onto the cob. Pull the husks back to cover the corn on the cob. Tie the husks up using husks that you removed, twine or a strip of tin foil. Place the corn onto the grill. Smoke or grill the corn for 30-40 minutes (until the corn is bright yellow).